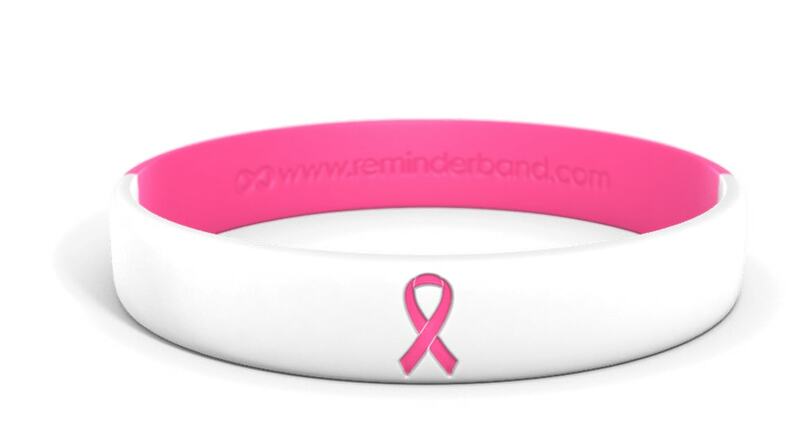 Reminderband offers custom cancer wristbands in nearly every cancer awareness color. Our bracelets are made from 100% silicone and will last for years. We provide in many sizes and in any quantity. Our band builder is easy and fun. Whether you are holding an event, supporting someone in your family, school or community, or simply motivating yourself or others with a positivity bracelet to keep fighting, our wristbands, keychains, and ribbons are the perfect way to raise cancer awareness and to help inspire others to fight and support your cause. Educate, build awareness, and show support. About one in eight women will develop breast cancer over the course of her lifetime. Many are fighting. Many are doing research to raise awareness of and stem the tide of breast cancer. Sharing wristbands or purchasing them to raise funds for an individual, family or organization fighting breast cancer is a collective way to show support. For breast cancer awareness, we offer a wide variety of options including bracelets, pins, and keychains. The awareness ribbon keychain or pin can be done in the universally recognized pink and can be customized to fit your preference. We also offer cancer ribbon clipart for any of our wristbands and wristband keychains. Great for fundraisers, breast cancer awareness month events, giveaways, or races and marathons. Get the word out with an orange leukemia awareness bracelet or wristband for a cause or in support of a family member who has been diagnosed. Great for fundraisers or spotlighting leukemia awareness month, our wristbands and keychains are an excellent way to get behind a movement. A white ribbon is used for lung cancer. Lung cancer is often underrepresented but can be brought into focus with our striking awareness products. From our 3-striped design to our marbleized or segmented bands, our signature silicone bracelets are a comfortable, easy-to-distribute way to educate people about lung cancer and ways to prevent it. Our awareness bracelets are also great gifts for cancer survivors.